In December 2010, the award of the 2022 FIFA World Cup to Qatar was announced to the ever-so-slightly shocked world football community. MB uses ‘football’ in it’s real sense, and not in the ‘American’ sense, where same word is used to describe some baby game with multiple stop/starts to allow viewers grab yet another pizza, ice cream & coke, and where players wear all sorts of body/baby protection, lest they bruise a limb or their highly gelled hair moves out of place. In fact, when one considers it, the only thing missing from the American game is soothers! But back to Qatar 2022. Much was/is made of Qatar’s relatively small population of almost 2M. What was not very much mentioned by detractors, surprisingly, was/is the fact that native Qataris make up less than 300,000 of the total population. The other 1.7M are expats like (or unlike) MB, who hold a work permit and residency visa allowing them to remain in Qatar as long as employment lasts. This is the exact same procedure that exists in almost all Arabian Gulf countries. None have ‘open door’ immigration policies, no more than any western country does; just their rules are different and are a product of their histories and other concerns, not least of which is the security of their citizens. For example, it is currently almost impossible for a Syrian citizen to get a residency/work visa for any country in the Gulf, on security grounds. That is notwithstanding the fact that many millions of Syrians work, and continue to work, in those same Gulf countries since before war broke out in their homeland. Those who had visas before hostilities got to keep them, while new aspiring entrants from Syria were generally blocked. Tough, but that’s the way the Gulf cookie crumbles. Only a country with sufficient existing footballing infrastructure, or the financial means to build one, can possibly host a tournament of such scale. The majority of Arabic speaking countries do not fall into either of the above two categories. None has sufficient infrastructure, so if you concede for a moment that the Arabic speaking region is entitled to host a World Cup (of which more later) then you can only look at those countries that have the finances to do so. Those countries that have the financial resources are generally countries of relatively small populations with much oil and gas wealth, compared to the populations of a Brazil or a Germany or a USA – to give examples of more recent hosts of the tournament. Sorry. But not their fault. Since the first World Cup in 1930 most tournaments were held in Europe or South America. Only the USA (1994), Korea/Japan (2002) and South Africa (2010) have broken the Euro/S American mould. Meaning at least, that most regions have got to some greater or lesser degree, a fair crack of the football whip. All regions that is, except a region of some 360M Arabic speakers who are, generally speaking, football crazy. MB often makes an effort to speak to the airport Passport/Visa control staff out these parts, sitting at their screens as MB has his Passport swiped and his iris’s and face scanned for the umpteenth time. When he answers ‘Ireland’ to the usual question, he is often met with the response from the robed Arabic Passport checker – “Robbie Keane is a good player, enjoy your stay” Actually, Robbie was of great benefit to MB when MB lived in Saudi Arabia! But MB digresses. Football is truly the international sport like no other. The Olympics, for all it’s touting, just doesn’t hold a candle. So football matters in this crazy world, and football matters even more where there isn’t much else going on, or where cultures or religions or daily temperatures do not permit much to go on, or in places that have not yet developed to an extent that provides the huge variety of social, sporting and other outlets that people in more developed parts of the world take for granted. So football does matter. People in the west do not realise how popular football is in the the Arab world, and how much it really does matter. Tomorrow night the Champions League final is on. Juventus v Barca. Every coffee shop and hotel lobby or bar with a TV will be ‘chocka’, with flavoured shisha smoke from hookah pipes wafting through the night air, delighting the shisha connoisseurs (but choking MB and others of his mindset – and ‘lungset’),and noise levels ebbing and flowing with the action. And whilst tomorrow night’s crowds will be huge, the crowds on any night there is a game on TV is also very large and noisy. Barca & Real Madrid are the two most popular sides, then everyone has a favourite team in the English Premiership (just like the Irish and many others the world over), and of course many support Paris St Germain due to it’s Arabic ownership connections. So, in the opinion of MB, it’s well time that the Arab region got their chance to put on the football show, if only from the point of view of sheer love of the game. But what about all the negatives MB? Apart from the tiny population (already addressed) – the mid 40C temperatures. We are all now aware that the tournament is officially moved to December and the temperatures are no longer an issue. But let us look at this issue in the context of the date of award of the tournament and analyse it a little more. MB is sure that matches could easily have taken place in air-conditioned stadia. Fully enclosed or almost fully enclosed structures as they are presently designed, would have made such an A/C scenario technically possible. So this much hyped negative does not hold much water in the opinion of MB. What would have concerned MB however, is how visiting non-Arabic fans would have coped with a 2 to 3 week tournament in ME summer temps. MB has to believe the evidence of his own eyes in response, and report to all that billions of dollars are currently being spent to ensure extensive new indoor facilities, such as a very large metro system, new town centres, and new whopping shopping facilities, that will provide comfort zones for tens of thousands on non-match days. So no effort and no expense is being spared in this regard. Workers rights and workplace accidents. A most serious matter and one that should concern all associated with the tournament and with Qatar’s continuing non-football development into the future. MB googled ‘workplace deaths in Britain’ earlier this week. For the last 6 years it’s an average of some 160 per year. The Industrial Revolution began in Britain in approximately 1760. So 250 years later Britain still suffers some 160 deaths per year in industrial accidents. Even one death is horrific, let alone 160, or whatever the number is in any country. The vast majority of nations try their best to reduce workplace accidents with new rules and regulations and robust enforcement. Twenty or so years back Dubai had a similar construction boom and was rightly criticised for lax safety standards, salary payment issues and poor worker accommodation standards. The fact was that the huge boom caught the authorities unaware and for a few years they were playing catch-up with developments on the ground. But in the end they solved most of the problems by shutting down unsuitable accommodation and introducing a raft of laws to protect workers and worker rights. Qatar is faced with a similar situation at present. A sudden huge construction boom has found their regulation and policing of industrial safety standards sorely wanting. But things are changing quickly, maybe in part due to international criticism, but also in truth, because the injury or death of any man or woman is as upsetting and distressing to a Qatari as it is to an Irish man or a German man. And all know that everything must be done to ensure that such accidents are reduced to the absolute minimum. And as already referred, 250 years after the industrial Revolution, Britain still suffers too many workplace deaths (the British numbers are actually better than most of its European neighbours btw) and British workers and Trades Unions continue to fight for better rights and better working conditions. Then consider for a moment that Qatar’s industrial boom has only occurred in very recent years. The company that MB works for is currently completing new worker accommodation costing almost 4M euro. MB recently visited another almost-complete worker accommodation complex about 1 hour drive from Doha costing some 12M Euro, again being built by the workers employer at his cost. MB was extremely impressive in terms of facilities and standards. All Qatari companies are now aware that the poor standards of the past, exacerbated by the recent boom, are not good enough and most are already taking affirmative action to address the problems. All are also aware that a host of new worker rights legislation will shortly become law and non-compliance will result in company closures, just as happened in Dubai and elsewhere. So the issues are being addressed and in the not too distant future will hopefully be a thing of the past. As the Qataris are tired of saying by now – if any corruption or wrong-doing is proven then let the law take it’s course. Not much more to be said on that score MB thinks. There is much innuendo and rumour, much of it coming from anti-Qatar anti-Arab quarters, but (so far) not much evidence of organised wrong-doing. But if it’s proven – then let the law take it’s course. Time moves on and Qatar football preparations continue apace. Qatari authorities have recently given the financial green light to the first 5 of 8 stadia. They are each of spectacular design, and some will be dismantled after the tournament and transported to poorer developing nations for re-erection. Not a bad idea and one never done previously. MB is hoping to attend some World Cup matches in Qatar, assuming the Lord spares him the health. Much of his life has been taken up with a playing or admin involvement in the sport. MB has lined the pitches, hung up the nets and cut the grass. Football is in his blood. And it’s also in the blood of millions of Arabs. Football brothers all. 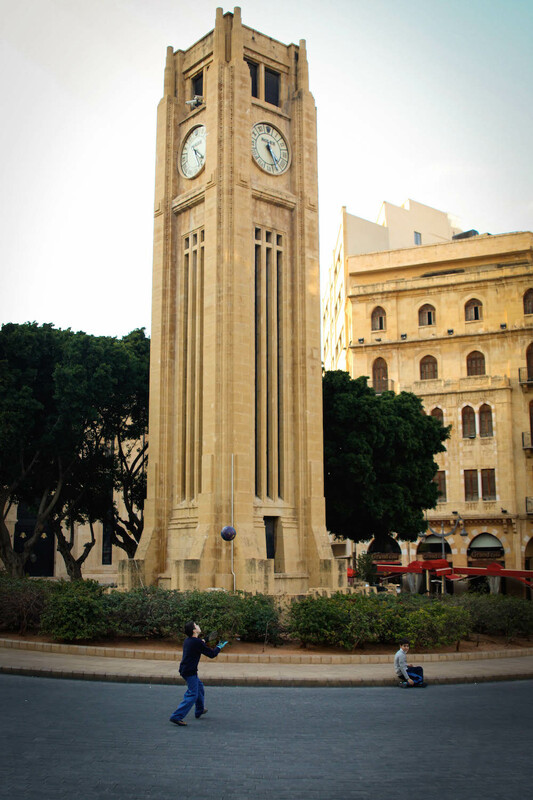 A 2012 MB photo from downtown Beirut. Kids playing football look the same in every country. Very interesting and informative Mike. With just 300k citizens and limitless wealth, does this mean that all citizens see a good share of the wealth. TH. Yes Tom. Far as I know Qataris have the highest nett income in the world. With such wealth and only small number it is easily achieved. The vast majority work in Government/Ministry/civil service positions and are very highly paid. Thank you, MB, for offering your insights on several fronts. It is commendable that Qatar is considering the lessons learned from Saudi Arabia and other nations on worker safety. Every life is a precious life. Most important: thanks for presenting a factual portrayal about so much. Sadly, only sensationalism sells these days. Listen to the reporter on the street (MB), and the perspective one has come to hold is challenged. And rightly so. Again, thanks! Oh, and by the way, on the FIFA scandal? We have the NFL black eye over here. I gave up on them years ago. Bring on the real football! Thanks CG. The situation is obviously a work in progress. But going in the right direction I think. And obviously, this entire region is sorely in need of good news stories. Fingers crossed.